#OperationBuckstorm Started By Anonymous Hackers ! 1. 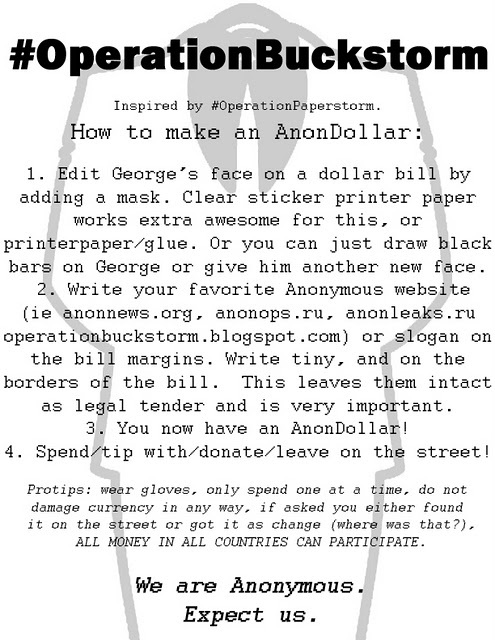 Edit George’s face on a dollar bill by adding a mask. Clear sticker printer paper works extra awesome for this, or printerpaper/glue. Or you can just draw black bars on George or give him another new face. (ie anonnews.org, anonops.ru, anonleaks.ru operationbuckstorm.blogspot.com) or slogan on the bill margins. Write tiny, and on the borders of the bill. This leaves them intact as legal tender and is very important. 3. You now have an AnonDollar! 4. Spend/tip with/donate/leave on the street! ALL MONEY IN ALL COUNTRIES CAN PARTICIPATE.